A view of the Organ Fountain from below. 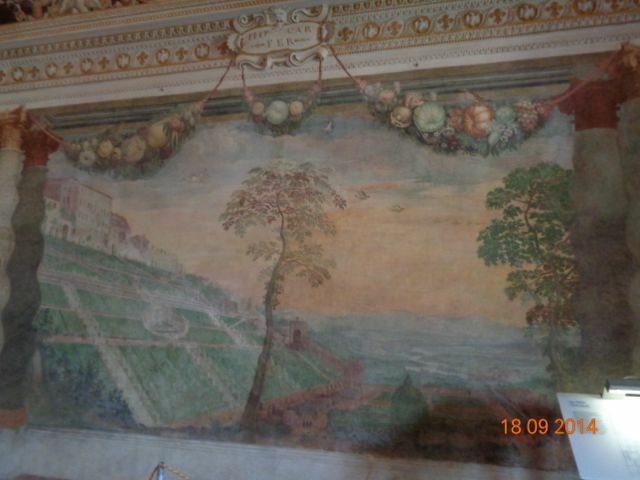 Villa D’Este. 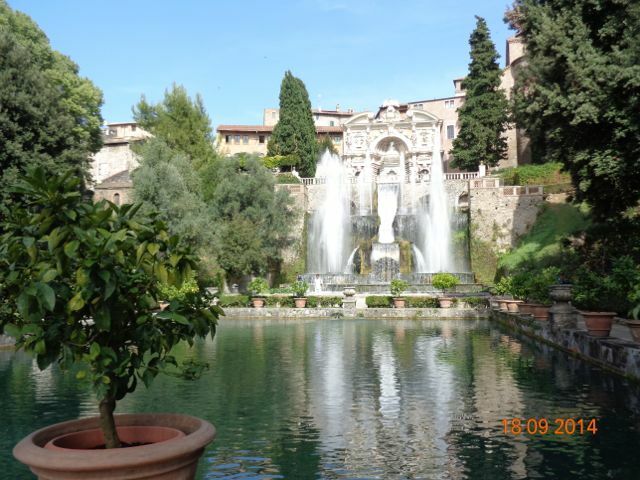 Today, we took a short day trip to Tivoli, the ancient home of emperors and popes. There, we saw the Emperor Hadrian’s home. It was a technological marvel, built in the 1st century A.D. It’s a single home, with many different buildings, that sits on about 120 hecatres. 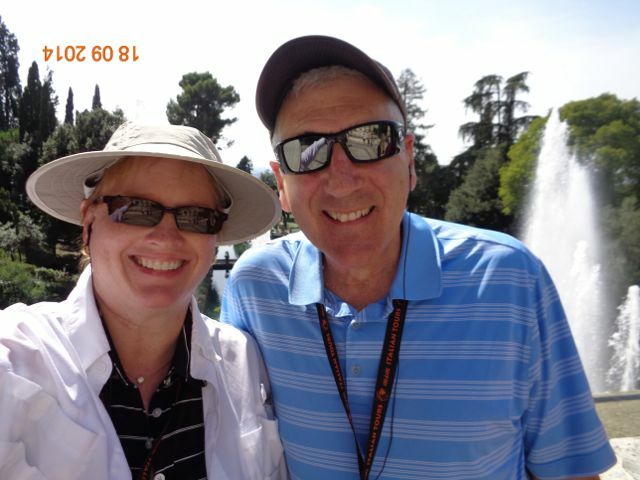 Considering the entire city of Pompeii sits on only 60 hectares, that’s a big, incredible house! 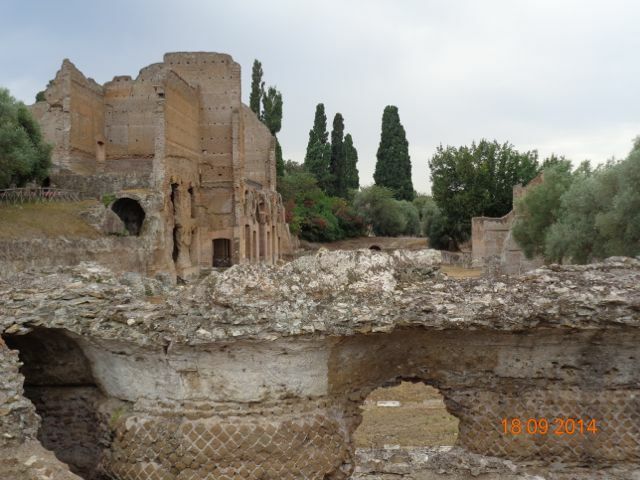 Some quick facts about Hadrian’s villa: It had two baths, one for Hadrian and his guests (the Small Bath) and another for the nearly 2000 slaves who worked at the villa (the Large Bath). That’s a lot of slaves and Hadrian couldn’t have them wandering around disturbing his peace, so there are several kilometers of tunnels running under the villa. In fact, the only entrance to the Large Bath was from this underground tunnels. Those tunnels are considered the world’s first subway because they were big enough for chariots to make delivers to the various buildings. 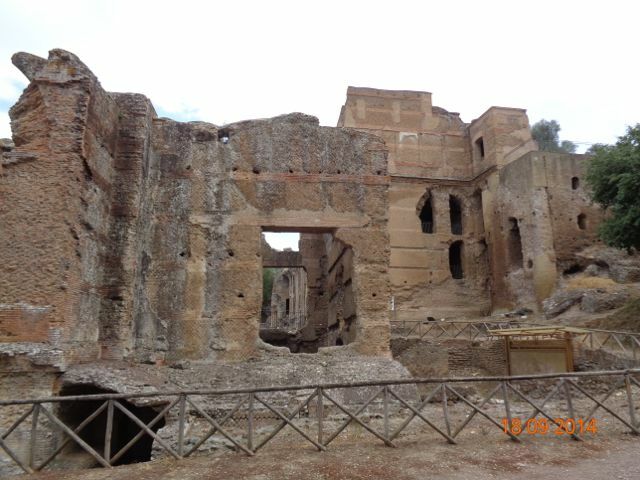 Finally, most of Hadrian’s villa was used as a marble quarry when Cardinal D’Este built his home in Tivoli in about the 1500s. That Cardinal was an important (and rich!) man since he was the son of Lucretia Borgia and a nephew of the pope at the time. 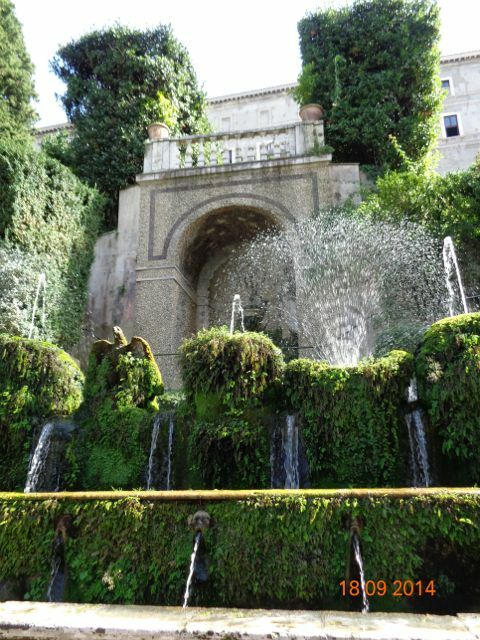 His home is known for its gardens and the nearly 500 fountains it contains. It was incredibly impressive and was used as a model for people like the Vanderbilts in the 1880s-1890s when they were building their incredible homes in the United States. I’ll let the pictures do the talking! 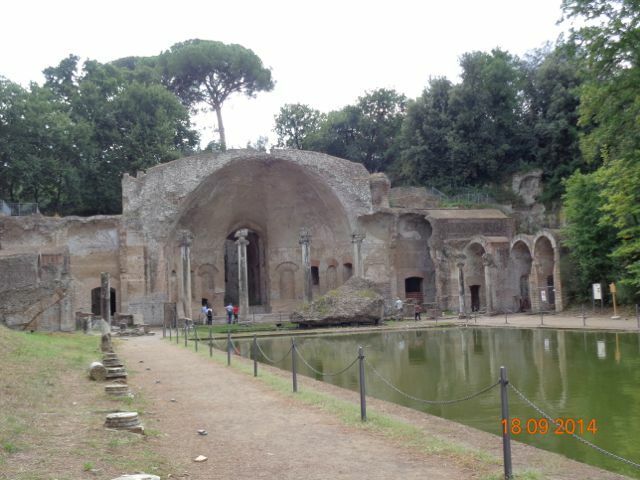 The large bath at Hadrian’s Villa. This is the outdoor dining room that seated 600 people, believe it or not. The guests sat all along the sides of the pool (which was NOT for swimming!) and Hadrian and his VIPs sat at the end under the roof. 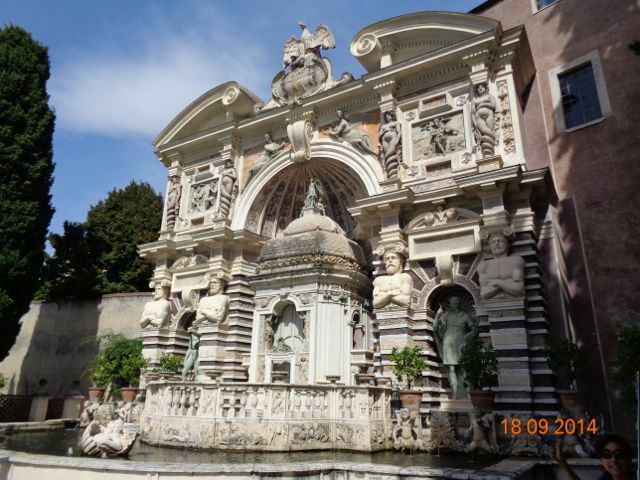 The only reason any of the statues or columns still exist is they had fallen into the pool and were covered with dirt, so they weren’t noticed when Cardinal D’Este carried away all the rest of the marble for his villa. A view down the side towards where Hadrian would have sat for dinner. You can see how the waterfall would cascade from the roof and curtain off the crowds. Here’s an idea of where the underground tunnels would have looked like. Of course, they would have been covered in Hadrians day. 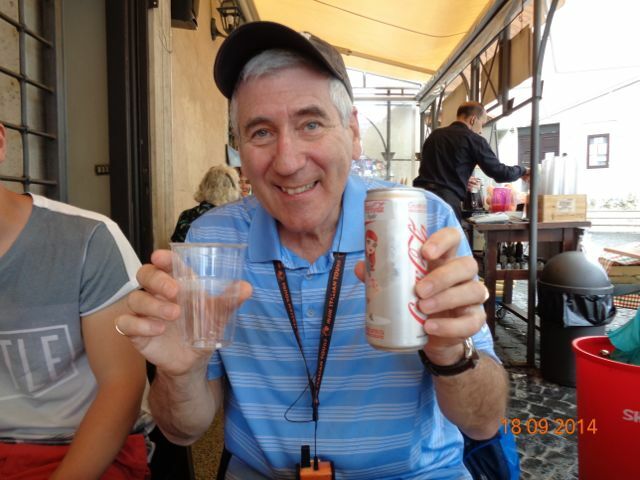 Bob actually ordered a Diet Coke with his lunch. Mark it down! We sat next to a mother and her 19 year old son from England and had a really delightful lunch. Since Mom was originally from Scotland, we had quite an animated discussion about the Scottish vote for independence taking place today. That conversation had the Australians across the aisle from us involved, as well. 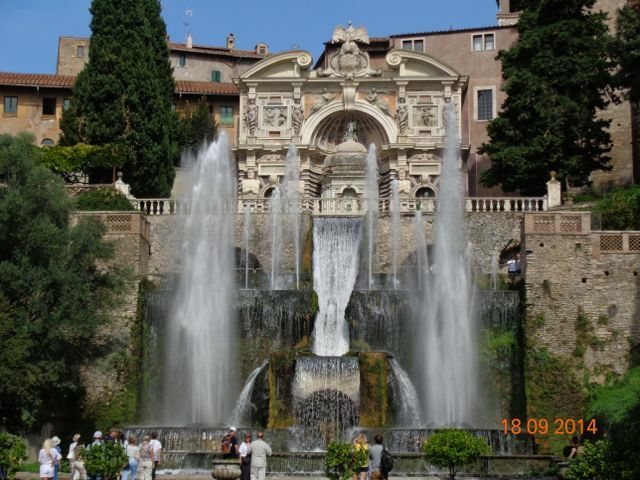 The fountain in the courtyard of Villa D’Este. 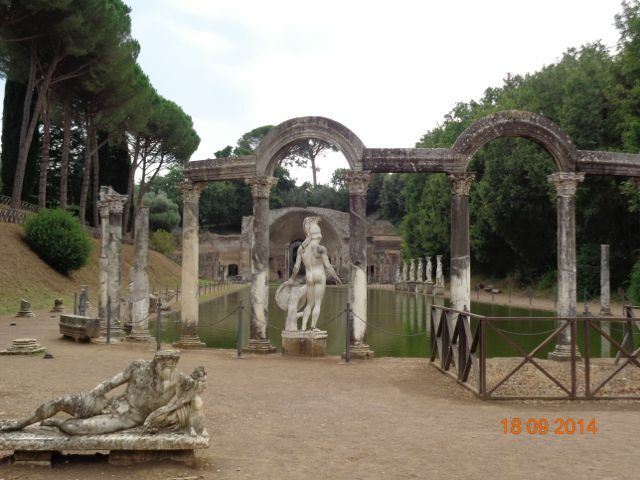 The statue of Venus along the bottom, just above the plants, was probably originally at Hadrian’s Villa. 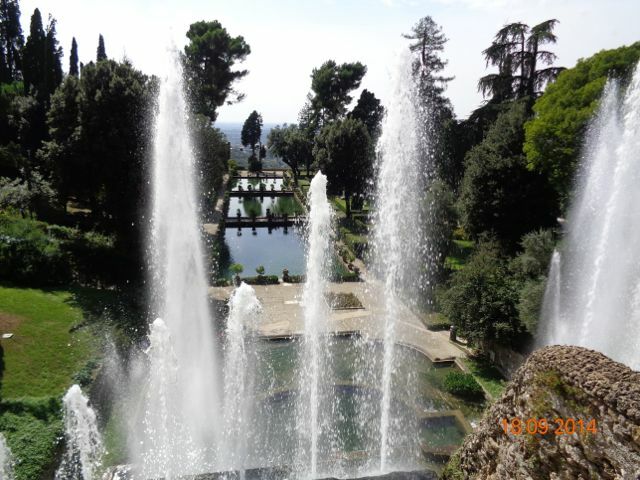 The gardens at Villa D’Este are built on a steep hill. Here’s a picture of what they originally looked like. 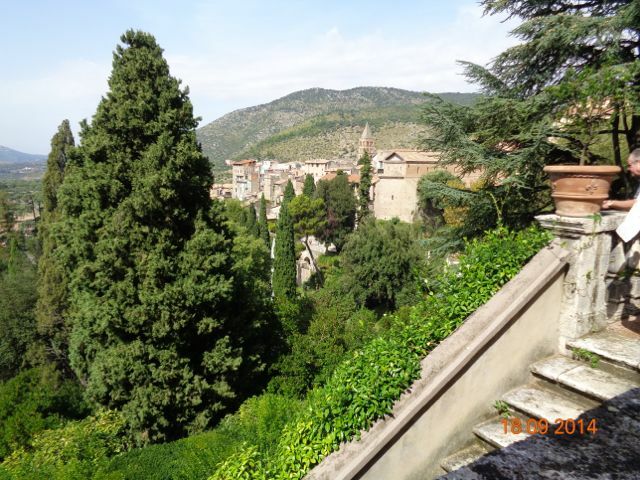 All visitors arrived at the bottom of the gardens and had to climb their way to the top to meet with the Cardinal in the Villa. We made that climb and I can tell you, it’s a cardiac workout. A view from one of the terraces on the way down. This is the Organ Fountain. The internal mechanism diverts water in a way that air is pushed through organ pipes and water plays over the keys, thus playing the organ. It’s a little like a player piano, only there’s no finesse. I thought the music sounded like a child’s attempt. Here’s a short video, you can judge for yourself! 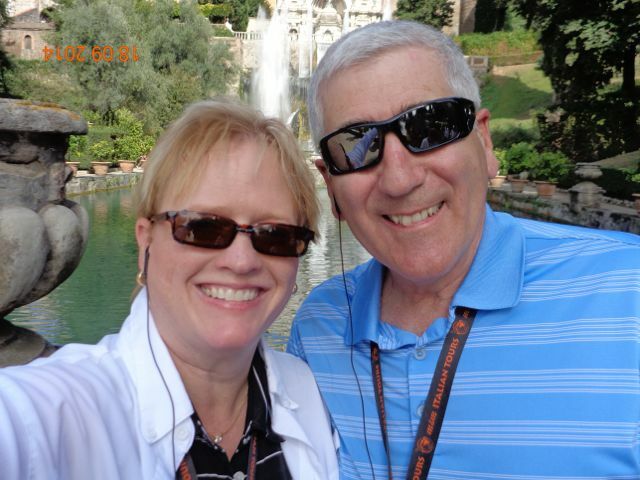 Here we are in front of the Organ Fountain. 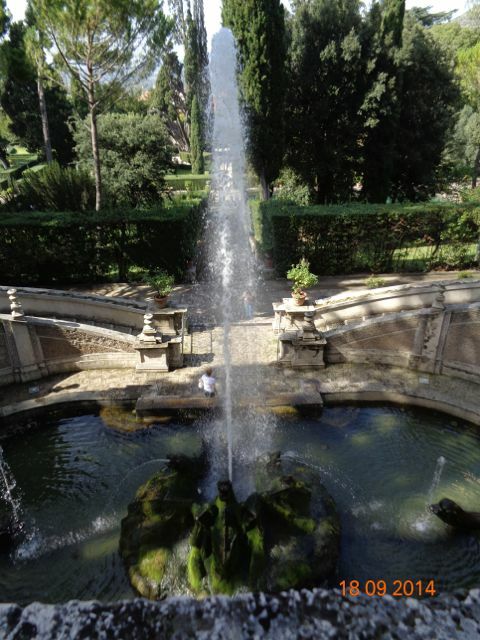 We’re facing the fountain and the picture below shows what it overlooks. It was so peaceful. A view from the terrace where the Organ Fountain is. Not far from the Organ Fountain is this restful grotto. 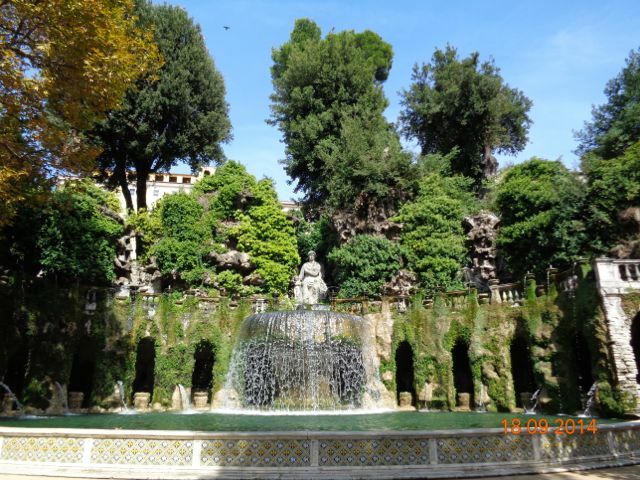 It was blocked to tourists, but there is a colonnade that runs through the back of this fountain. On a hot day, it would have been cool and restful. This is the walkway of 100 fountains. Again, it was wonderfully cool and an nice break from the heat. 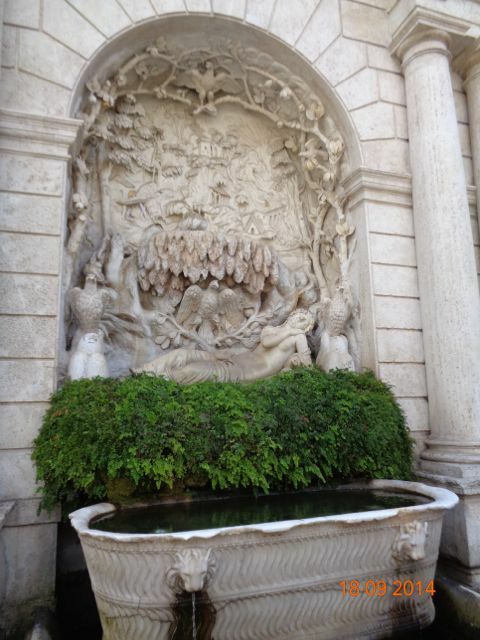 This is the Dragon Fountain. I’m sorry I didn’t get a better picture of it because it was quite impressive. From the terrace I’m standing on, two grand curved staircases descend on either side. Both have water running along beside them and it was very grand. 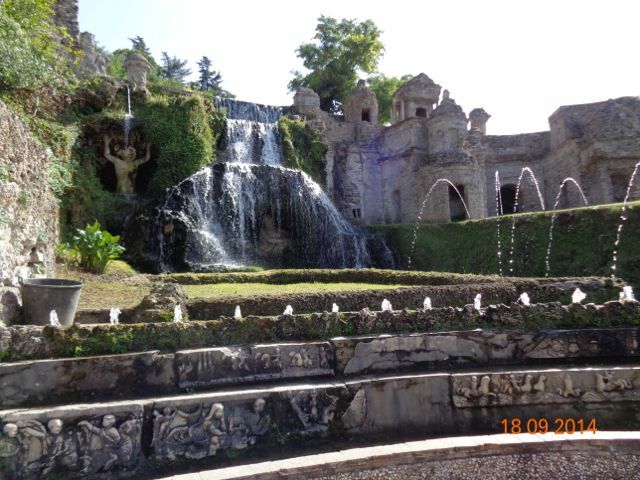 A view of the Villa itself from the walkway of 100 Fountains. You get the idea of how steep the hillside is. It was quite a climb! 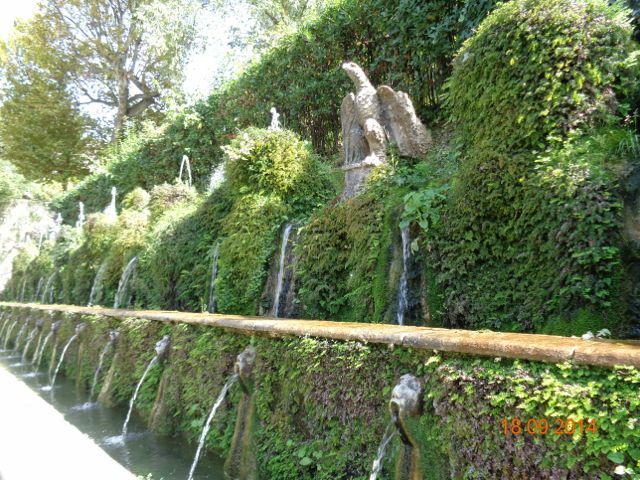 I don’t know the name of this fountain, but it has several tiny models of some of the ancient buildings in Rome. Some of them show us what those buildings looked like since they fell down long ago. This is the Organ Fountain from below. It’s a showstopper.